This is likely to be the next 7-inch single, a Kay-Dee / Ubiquity release with the extended mix at 33rpm on one side, and the regular mix at 45rpm on the other. Keep your eyes and ears peeled. What an honour to have Kenny Dope work with the material..! Over the summer A-side Studio commissioned a series of works to feature around the site of Heartlands, a regeneration project set in the mining areas of Pool and Camborne. I worked on a collaboration with Tim Lake to produce these birds for the fences surrounding the gardens. We just hope the seagull wind vane survives the winter gales..! September was a month of throwback goodness, with Goodwood Revival and the Hip Wigglers Invitational within the space of 2 weeks. Organised by James Parry, the Hip Wigglers showcases some stylish noseriding from some of the best traditional loggers in the country. This year the talent was taken up a level with some international invitees, and a nice little swell offering small peelers. It was an honour to receive an invite again, and humbling to surf among such talent. 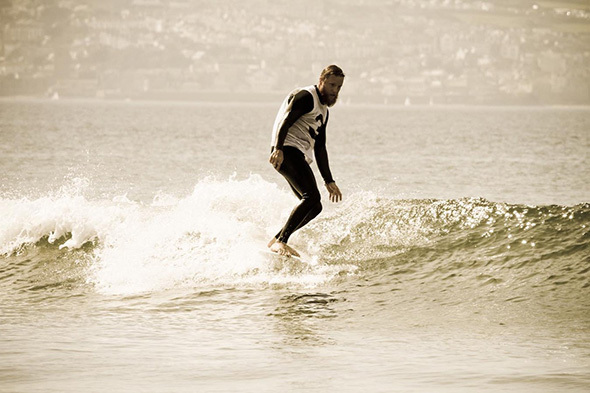 Having been one of only a handful of traditional longboarders in West Cornwall over the past 15 years or so, it's really encouraging to see some of the younger surfers getting into it and pushing this style of surfing in a really positive direction. Jersey man, Joe Davis took the title this year with an uncanny ability to hang on the nose longer than anyone else. Here's some great shots from the day by Russ Pierre (there's more on his website here), plus a little vid John and Mathilda put together. My uncle (pictured at the top) happens to be a very good racing driver, and has been invited to race some pretty nice cars in his time. Goodwood Revival has been going since the 90s, and this time round he was driving in the Shelby Cup, a 2 driver race celebrating the 50th birthday of the AC Cobra, with a grid of small-block Cobras of a type that raced between '62 and '66 - how's that for a gig! As you can see, there's no shortage of beautiful cars at Goodwood Revival. The grid of Ferrari GTO's was worth an unprecedented £300 million, but my favourite had to be either the Mercedes GullWing or Aston Martin DBR1. This year's Vintage Surf Meet is all set to take place again at Lusty Glaze on the 14th July. Pleasure to be asked to do the artwork again, this time with John Isaac's Model A Ford, which was turning a few heads last year. Organised by Al, who runs a vintage surfboard blog, the event looks to be attracting more punters and enthusiasts alike. We have done a limited edition of pocket tees and screenprints with the design above. More info can be found on Facebook, but you might need to be a friend of mine to see it..! Picked up the 45 for this a while back on the mighty fine Truth & Soul Records - The Dynamic Set featuring Liam Bailey, who I think have a new single coming out soon. In the meantime, make sure you pick up the latest from Lee Fields & The Expressions on the same label. Apologies for the lack of posts of late - just got back from a trip to Central America chasing waves, offshore islands and tropical fish. Panama is a beautiful country with some stunning islands. Nice enough to pop the question to my long time partner of 6 years and lovely lady (pictured above), who a couple of days later managed to cut her ring finger with the fin from her surfboard, requiring stitches (ouch)! Still, we'll make an honest woman out of her, or try to... photos by Helen Gilchrist. Another beautiful video, shot and edited by Chris Mannell, featuring B-side Seaside from the debut Frootful LP, and some nice sliding by Sam (from the forthcoming movie, Skimming the Surface). Playing the low notes on this track, by the way, is none other than Damon Minchella, who it is rumoured might replace Mani as Primal Scream's bass player..! A few shots of our gig at Miss Peapods while on tour last month by Maf. Thanks to everyone who came along to any of the shows - shame a couple of the dates were cancelled; especially the London show, cancelled last minute due to a power failure on the whole of New Oxford Street (after a long drive up from Cornwall I might add - gutted!). And apologies for the lack of posts recently, last month was super busy, but here's wishing you all good times and exciting things for 2012 - Happy New Year..! Out today on Freestyle Records, the new single features a reworking of Slowtime, the album track Latin Strut, plus a remix of Slowtime by Lack of Afro. Available as a 12-inch and digital download, Freestyle have a bundle offer here. There are also 45 limited edition copies, with a sleeve screenprinted by hand (pictured above), available with either a white or dark blue print. These will be for sale on the tour, with some copies exclusively available from Freestyle (here), plus a few independent record shops nearby the venues we will be playing at. Four of the sleeves contain a golden ticket, winning you either a guestlist (plus one) for one of the live shows, or a limited edition tour poster..!